Regardless of the clocks going forward the other week, if you’re not a ‘morning person’ getting up can be a challenge! If you work a regular 9-5, have children or other commitments that necessitate being an early bird, there’s no escaping being a slave to the morning alarm either! However, it isn’t all doom and gloom! Mercifully, there are several strategies for feeling more alert in the morning that will make getting up more bearable… and without any Herculean effort required. Here are a few to get you started! The easiest way to ensure you’re getting up and at ‘em is to simply move your alarm clock. By positioning it further away, you’ll be forced to get out of bed to turn it off, and that’s the hard part done! Make sure it’s far enough that anything more than an extra stretch won’t get it; the other side of the room or even the landing outside your bedroom will do the trick. The new and cool way to wake up is with a sunrise alarm – particularly effective in winter. If moving your alarm clock really isn’t cutting it, consider this option. Instead of the rude awakening of an offensively upbeat alarm jingle, sunrise alarms have a lamp that gradually brightens during the hour before your alarm goes off, emulating a sunrise. Your body is tricked into waking naturally rather than been jolted out of a deep slumber. People fail to get into a new routine because the shock of change makes it feel unattainable. Instead make gradual changes that don’t feel so tough. For instance, if you want to start getting up an hour earlier, you’re more likely to achieve this if you make the change slowly. To start with, just try to get up ten minutes earlier for several days, which is no challenge at all. Repeat the process until you’re rising at the optimal time for you, by which point there’ll be no shock to the system. Our bodies are conditioned to respond to being awake when we see the sun. As soon as you get up, rather than potter about in the dark, open the curtains and let in the natural light. For bonus points, open up a window, too. Fresh air is really stimulating and will help you to welcome the day. It’s by far the most unpleasant method on this list, but this 90-second discomfort is arguably the most successful. At the end of your morning shower, blast yourself with cold water for 30 seconds, followed by hot water for 30 seconds. Finish your shower with a final blast of cold water for 30 seconds. There is a point to this; the rapid change in temperature will increase blood flow and stimulate the body and mind. You’ll thank us… eventually. Exercising in the morning (not what many of us want to hear) is the best way to feel alert and meet the challenges of the day ahead. Getting the blood pumping will boost endorphins which give you energy and improve mood. Additionally, you’ll kick your metabolism into high gear and burn more calories. You’ll feel more alert, but you’ll improve your physical well being, too. As you’re getting dressed and putting your make-up on, eating breakfast or travelling to work, play music with a healthy beat to it. The energy in the music will rub off a little, helping you feel more prepared and positive about the day ahead. Okay, that’s our checklist for starting the day right. Notice that there wasn’t a single mention of caffeine? Far be it for us to deny our readers from tea or coffee, but if you enjoy a brew in the morning, try to leave it until later on. 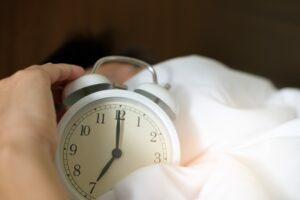 Your efforts to wake up earlier will be much more successful and lasting if they come about organically, rather than pumping yourself with chemicals to propel you through the day. What is your strategy for being more alert in the mornings?